Me and My Dad! Team GPK! Some of my favorite healthy snacks I tasted, some new, and some old favorites: Mary’s Gone crackers, Go Raw products, Two Mom’s in the Raw, Brad’s Kale Chips and Onion Rings (yum! loved the Rings of fire if you like spicy! ), Amazing Grass Green Superfood Bars (don’t look at the inside and you’ll be fine! they taste great, I just saw them in the supplement section at Whole Foods not the bar section). Cliff Bar and Kind had new versions out. And Amy’s is coming out with knock-offs of milky ways, snickers, toffee bars that are AMAZING, coming out later this year. While not “healthy” they are good clean natural ingredients for that special occasion. Justin’s Nut Butter remains one of my favorite brands, my daughter and I LOVE the hazelnut spread and go through a container every week or so, spreading it on toast and for dipping apples. Their peanut butter cups are to die for! I discovered NuttZo seven nut and seed butter at the show. Loved it! Awesome combos of nuts and seeds with crunchy and creamy versions of their original formula, a peanut free version and a chocolate one. The package them upside down so you don’t have to stir them. Smart! 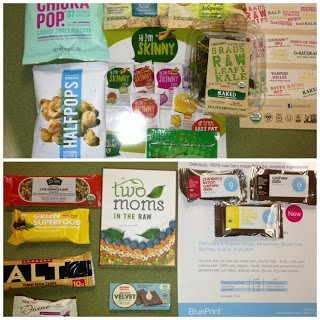 Lots of new dried fruit puffs, dehydrated fruit mixes, pouches in every flavor and mix of veggies and fruits, super grains, including the super grain of choice at the show “Chia!” Happy Baby has a ton of new pouch combos and flavors. Great assortment, wish all these were out when my daughter was a baby! I had the honor to meet Shazi Visram the founder of Happy Baby. What an inspiration to mompreneurs and product innovation. Little Duck Organics had some great snacks and cute multi-purpose green packaging with their Mighty Oats product, when you are done your little one can plant it in the garden with built in seeds. Cute! Another new favorite: Peas of Mind new Peas of Pie pizza, like real veggies actually baked into the pizza dough that you can see! And it tasted amazing! Find them at Target everywhere. The hot new natural sweeteners you will be seeing everywhere: Coconut Sugar and Monkfruit (this was new to me, zero calorie is from the monk fruit and advertises that is does not have the “aftertaste” like stevia does. They say you can bake with it, 1 to 1. I love Big Tree Farms new dehydrated coconut! Just add to you glass of water for instant coconut water, saves tons of plastic bottles!! Plus they have amazing coconut sugars. I am a big tea drinker, and have to mention my favorite new tea: Rooibiee Red Tea, made from the rooibos bush to be high in antioxidants and naturally caffeine-free. Love it and it is now available in most grocery stores. Majority of the products are available at Whole Foods. We were excited to see Whole Foods announcement at the show that they plan to mandate all GMO-free products within 5 years. Great news for consumers! We are headed in the right direction, but have leaps and bounds to go! Go to your local grocery stores and request these and other natural products. They listen! PS: Please make sure to follow Green Plate Kitchen and me on Twitter and Facebook!